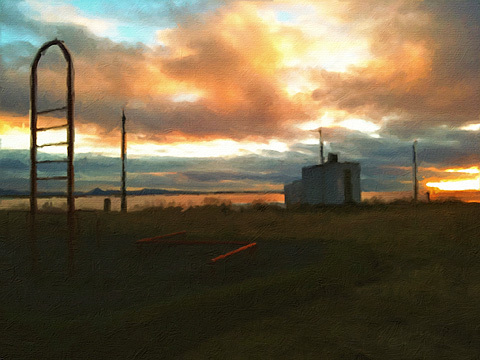 Home » iPhone App Reviews » PhotoArtista Oil: Let’s Pretend We Can Paint! PhotoArtista Oil: Let’s Pretend We Can Paint! Whoever spread the notion that photos can successfully be digitally turned into paintings with a couple of clicks should be spanked very badly. This is how I see it; everybody is free to disagree. But so far I haven’t found a single successful way to make a photo look like a real painting with digital filters, not even from the most renown developers. Be careful: I haven’t said a “realistic” painting. Even the best results obtained with ready-made filters are nothing like actual paintings, photos of paintings or even like photographs of actual paintings taken from photos. Or… whatever. They retain that certain lousy artificial quality that is terribly unattractive. To obtain an effective painterly effect, first of all you need to work a lot on your photo, concentrating not on reproducing useless trivialities like the embossing or the direction of the strokes or similar, but on trying to recreate a general feeling, an atmosphere, that is usually very subtle; you have to work on bringing out that certain something, if you know what I mean. So far, even the best filters are more focused on the trivialities I was talking about than in defining and trying to reproduce this something, that is what truly differentiates painting and photo. Let’s be honest though: we cannot ask too much of mere filters. When technology will reach a higher degree of sophistication and artificial intelligence will be improved, maybe the visible results will be more convincing. I’d like to add that painting and photography can be considered sisters in the realm of visual arts, but they are definitely not interchangeable, especially after the achievements they both have conquered over the years. To fulfill their role, they should take different paths and give different interpretations, even of the same subjects. With PhotoArtista Oil, JixiPix tries to give anybody the ability to become an accomplished oil painter with very little effort. I’ve read comments of some people using this app boasting about the fact with PhotoArtista Oil they could fix even the most outrageously horrible photos they had taken. I’m not sure how the developers should feel reading comments like these; I hope they’re not particularly proud of such publicity. PhotoArtista Oil works both with camera roll and with shots you take with the built-in camera. As with other apps in the same range (PhotoArtista Haiku, PhotoArtista Sketch and Vintage Scene), you have an array of presets ready for using from which you can start working. You can simply choose one of those presets and save your photo or you can adjust several variables to make your picture suit your personal taste. You can modify intensity and type of strokes, canvas texture and color, color tones, apply edges, and so on. If you want to use again the preset you have created yourself, you can save it. Processing times are extremely long and unnerving; deciding to choose a style and then changing your mind can make you waste 5+ minutes of your life. Each time, not in a lifetime. This can be OK for you, I don’t want to imply you are in a hurry… I’m just saying. Overall, the results are good, but not astonishing — but this depends of course on your personal idea of astonishing. The canvas in particular doesn’t look very realistic, especially if you choose to look at your picture at full resolution. If you are not very careful with your parameters, the strokes will not look natural at all. Not to mention that you shouldn’t expect the app to make a good job equally with any single photo you throw at it. Anyway, if you want to turn your photos into paintings at all costs on your Apple device, this is perhaps as good as it can get.